1000 lb. (450 kg.) capacity. Extended perimeter bumper for added protection. Extra load Lake-Glide® 8˝ casters provide a smooth, easy transport. 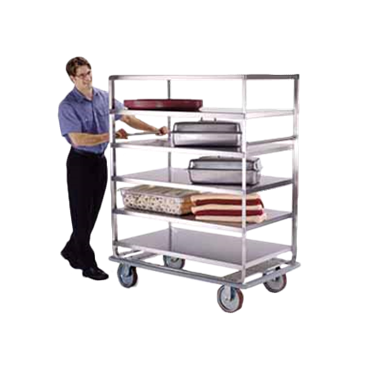 Stainless steel, unitized welded construction gives you years of service life. Unit shall be of all-welded stainless steel construction, with a total carrying capacity of 1000 lbs (450 kg). Shelves shall be of 18 gauge stainless steel with hemmed edges on all four sides for extra strength. Leg/frame assembly shall be of 14 gauge .120 x 1˝ x 1˝ stainless steel angle in U-frame design, eliminating the need for corner reinforcements. Casters shall be extra-load plate type, two swivel and two fixed, and shall be bolted to frame and cross member. Swivel casters shall feature double race, double ball bearing swivel design. Caster wheels shall be 8" diameter with non-marking polyurethane tread and roller bearing hub for easy movement under heavy loads. Cross members shall be 18 gauge stainless steel with galvanized steel reinforcement. Unit shall feature vinyl perimeter bumper extended from frame to protect walls and doors, and tubular push handle on both ends. Unit shall be NSF listed. 3 and 4 Shelf Models Only: Shelves shall be joined to legs with continuous TIG weld for extra strength. 70˝ Long Shelf Models Only: Shelves shall be reinforced on long sides with 14 gauge 1˝ x 1˝ stainless steel angle welded under the shelf edges.